Europa, as viewed from NASA's Galileo spacecraft. Visible are plains of bright ice, cracks that run to the horizon, and dark patches that likely contain both ice and dirt. Image reprocessed by Ted Stryk. Some inveterate searchers after life have decided Europa is the next place to look. One of Jupiters's finest, the thick icy surface had previously put astronomers off the scent. 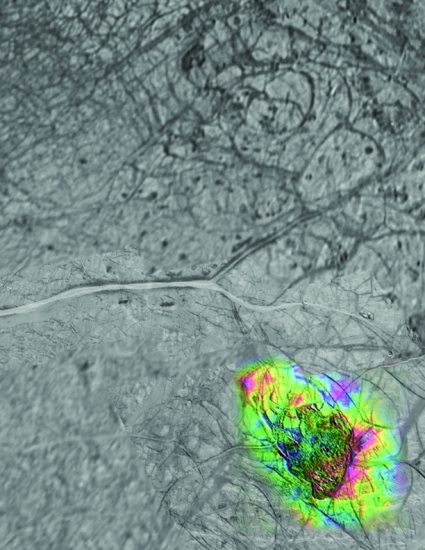 Now Antarctican research has helped identify chaos terrains on Europa's ice. 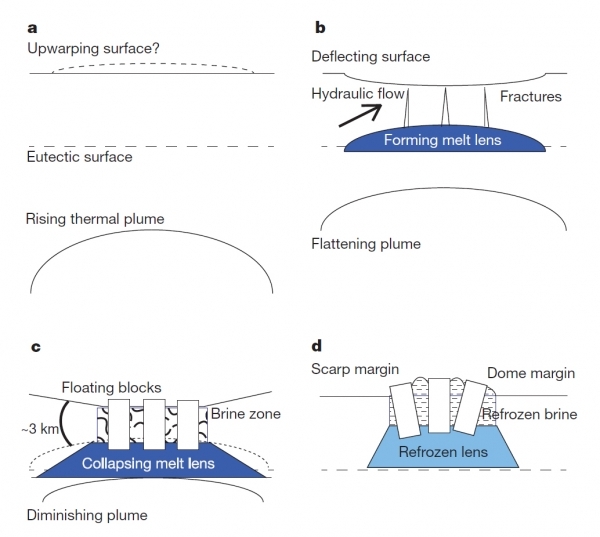 Researchers believe that ice is behaving exactly like Earth ice when melting and freezing phases cause the chaotic surface they have recognised on parts of Europa. "This new understanding of processes on Europa would not have been possible without the foundation of the last 20 years of observations over Earth's ice sheets and floating ice shelves," said Don Blankenship, University of Texas at Austin's Institute for Geophysics. Texas have provided a video to help explain. Don co-authored the paper in Nature with Britney E. Schmidt who is a post-doctoral fellow there and liaison person for NASA's Dawn Mission, Wes Patterson, planetary scientist at the Johns Hopkins University Applied Physics Laboratory, and Paul Schenk, planetary scientist at the Lunar and Planetary Institute in Houston. The authors combine great knowledge of Europa and ice geophysics with enthusiasm for discovery. 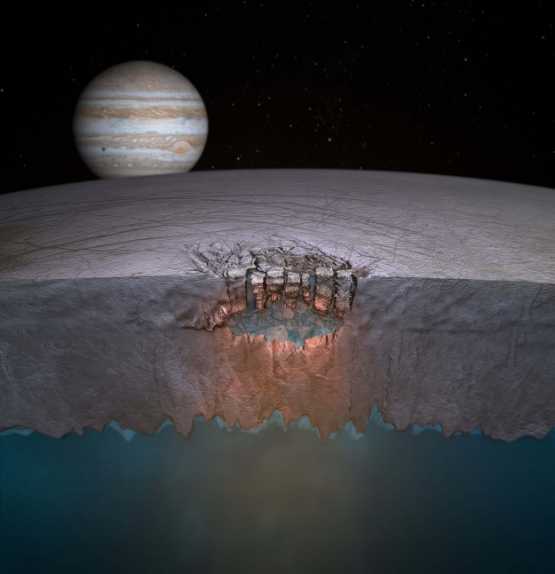 "The water could represent a potential habitat for life, and many more such lakes might exist throughout the shallow regions of Europa's shell," expounds lead author Britney. Europa's "Great Lake." Researchers predict many more such lakes are scattered throughout the moon's icy shell. Credit: Britney Schmidt/Dead Pixel VFX/Univ. of Texas at Austin. She has a point. Few similar searches have such likely ingredients for future fruitful research (and probes through the ice, of course.) She has helped prove that the thick ice can vigorously mix together, allowing some communication between the depths and the surface for any biological (or chemical) actions. NASA's Galileo of course has provided many wonderful alien views on its extensive journey. Two chaos terrains were photographed by the spacecraft to stimulate the research effort now growing for Europa's probing. The scientists are reporting the potential lakes as the same size as the combined Great Lakes, as you can see, but they can be regarded as sizeable lakes that are dwarfed of course by the deeper Europan ocean. As for life, that probe in 10 or 20 years time has to be funded and successfully sent. Thanks to Galileo and many others huge success to date, we can but hope that we will eventually discover more evidence of molecules that are organic or organisms that can display their existence.